What a great weekend I had with my family. We spent tons of time outside from baseball games, to yard work, to playing catch, and looking around at an outdoor nursery. It is so nice to have the sun shining and the grass green. I feel so blessed to have so many great things around me... mostly my family. I DID go to the temple Friday night and totally enjoyed myself. What a calm and rejuvinating place the temple is. I love it. Saturday evening Jake, Mason and Sadie took off on a shopping spree for me. They returned with gifts, and a turtle ice cream cake that was so yummy. It made my birthday surprising and fun and I felt very loved. 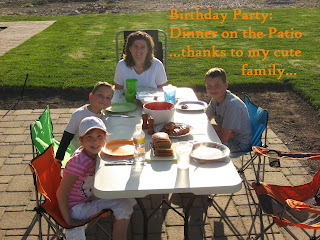 Jake took over the grill and the kids set up the table and we fully enjoyed dinner on the patio. I don't mind 34! If this is the way this year is going to be spent, with a family like this... I'm the Luckiest Woman in the World. Happy Birthday Jenny! 34 is a great year. It is half-way over for me and it has been eventful. 2 more weeks until my due date and so sometime soon I will have number 4! Happy birthday!!! I thought about you yesterday since Matt's Dad's birthday is the same as yours. It is always a fun reminder of two of my favorite people!! Hope you had a great day! Glad you had a great and happy birthday! Isn't it fun to be spoiled! Yay! I'm glad you had a good birthday and that I got to talk to you. I really will make plans to visit soon. You deserve to be partied! HAPPY BIRTHDAY! are you familiar with hoops and yoyo?